Homelessness in Canada is dire and responses to the crisis are growing more sophisticated. Communities are beginning to recognize the differences between homeless youth and adults and are reshaping their services to reflect that fact. Many are seeking an end to homelessness, rather than just mitigation of its harm. Some are collecting data and managing performance. The most advanced communities are pushing for a funding regime that respects their expertise. 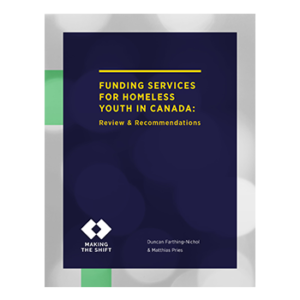 In partnership with A Way Home Canada and the Canadian Observatory On Homelessness, the MaRS Centre for Impact Investing has written a review on how Canadian governments fund homelessness services. The review discusses how the money flows, who decides how to spend the money, and how we might shift the money regime to get better results for homeless youth. It highlights how some governments – such as the federal government, Ontario and Alberta – are putting decisions in the hands of communities. It asks how Canadian governments can both empower communities and guide them toward evidence-based practice. 1. A rigorous approach to experiments: When testing new programs, governments should require and pay for strong evaluation design. Homelessness is a complex problem. Without true experiments, communities cannot know what works well. 2. An outcome-based component to community funds: Governments should weigh tying a small amount of a community’s homelessness money to its results. Specifying results without dictating how communities achieve those results allows central funders to express a vision for the homeless system without interfering where communities know best. 3. A cross-departmental fund for youth: Governments should explore cross-departmental funds that pay for the results of homeless youth projects. A fund in which each department only pays for results related to its mandate may help to realize a response to homelessness that does not stop at departmental borders.